In the market for a mechanical engineering job? Check out this sample resume to design and construct the right document for your search. In the market for a mechanical engineering job? You may be plenty familiar with designing, building, and testing equipment and devices, but we're guessing you're less familiar with the components of a solid resume. No problem! 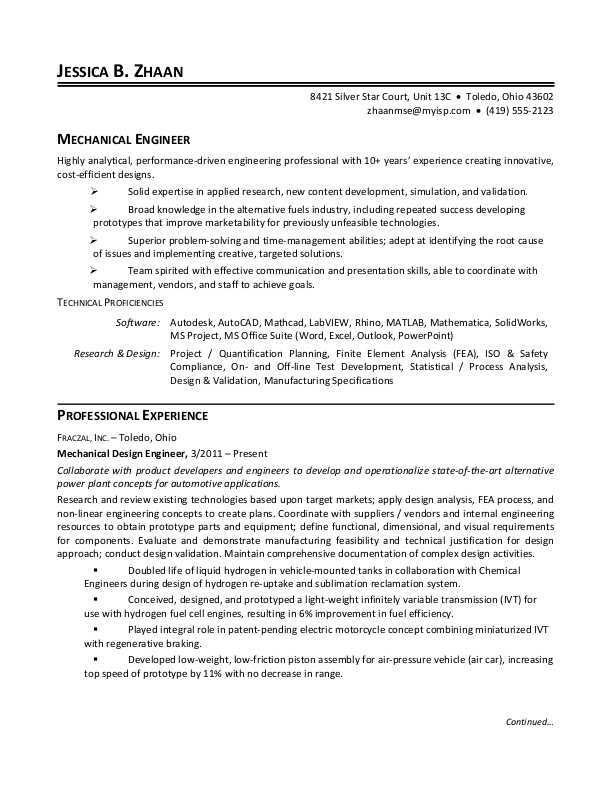 Check out this sample resume for a mechanical engineer below to design and construct the right document for your search, and download the sample resume for a mechanical engineer in Word. As a mechanical engineer, you can expect to earn a median wage of $85,880 per year, or $41.29 per hour, according to the BLS. Additionally, you can learn more about engineering careers and search for mechanical engineering jobs on Monster. Highly analytical, performance-driven engineering professional with 10+ years’ experience creating innovative, cost-efficient designs. Solid expertise in applied research, new content development, simulation, and validation. Broad knowledge in the alternative fuels industry, including repeated success developing prototypes that improve marketability for previously unfeasible technologies. Superior problem-solving and time-management abilities; adept at identifying the root cause of issues and implementing creative, targeted solutions. Team spirited with effective communication and presentation skills, able to coordinate with management, vendors, and staff to achieve goals. Collaborate with product developers and engineers to develop and operationalize state-of-the-art alternative power plant concepts for automotive applications. Research and review existing technologies based upon target markets; apply design analysis, FEA process, and non-linear engineering concepts to create plans. Coordinate with suppliers / vendors and internal engineering resources to obtain prototype parts and equipment; define functional, dimensional, and visual requirements for components. Evaluate and demonstrate manufacturing feasibility and technical justification for design approach; conduct design validation. Maintain comprehensive documentation of complex design activities. Doubled life of liquid hydrogen in vehicle-mounted tanks in collaboration with Chemical Engineers during design of hydrogen re-uptake and sublimation reclamation system. Conceived, designed, and prototyped a light-weight infinitely variable transmission (IVT) for use with hydrogen fuel cell engines, resulting in 6% improvement in fuel efficiency. Played integral role in patent-pending electric motorcycle concept combining miniaturized IVT with regenerative braking. Developed low-weight, low-friction piston assembly for air-pressure vehicle (air car), increasing top speed of prototype by 11% with no decrease in range. Researched and designed new auxiliary equipment to ensure ongoing industry advantage for a CVT / IVT transmission manufacturer. Developed new tooling concepts and techniques to maximize production effectiveness. Conducted build-versus-buy analysis for new equipment. Teamed with senior engineers to prototype equipment; conducted project / qualification planning for each prototype. Assisted with design documentation utilizing detailed technical drawings and engineering specifications. Enabled 11% increase in output across three lines by designing, prototyping, testing, and rolling out faster robot-arm assembly. Contributed to development of new belting system for flagship CVT product, leading to 3% friction decrease during high-RPM operations. Integral to design of new and upgraded equipment for a leading supplier of automotive dies for General Motors. Analyzed equipment performance and identified inefficiencies. Interfaced with production managers, engineers, and project managers in designing, prototyping, and testing new equipment. Composed technical specifications and design drawings. Offered major contributions to three-year line overhaul plan, submitting multiple schematics for peer review and validation; concept accepted and integrated into final rollout. As you can see, a resume is made up of multiple sections that highlight your skills and experience—complex stuff—but the finished product needs to be something that's both impressive and easy to read. Could you use some help building it properly? Get a free resume evaluation today from the experts at Monster's Resume Writing Service. You'll get detailed feedback in two business days, including a review of your resume's appearance and content, and a prediction of a recruiter's first impression. Think of it as cost-effective design advice.